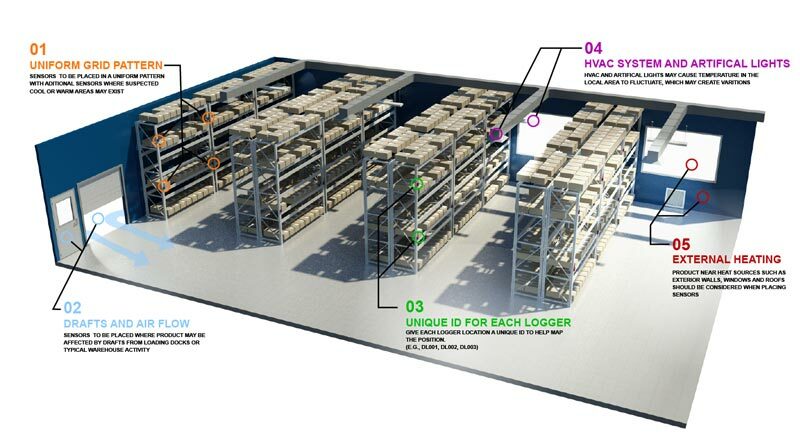 Temperature mapping is important for verifying the efficacy of temperature controlled storage systems such as cool rooms, fridges and warehouses. It is vital for businesses that work with temperature sensitive products such as pharmaceuticals or warehouses. The process of mapping outlines the differences and changes in temperature that occur within a single temperature controlled system. This is due to influences like opening doors, proximity to cooling fans, personnel movement, and the quantity of products being stored at any given time. Temperature mapping locates the points of greatest temperature fluctuation and difference then analyses the causes of these. Conditions are created to verify that a system maintains the correct temperature in all situations when influenced by external factors such as weather and internal factors such as airflow restrictions and the operation of the Heating, Ventilation and Air Conditioning systems. The effects in difference of temperature are calculated to ensure the systems meet industry standards. The temperature of different spaces within cooling rooms, industrial fridges and other controlled temperature environments can vary by up to 10°C. Generally, the central space within a chamber maintains constant temperature, however the corners and areas surrounding the fans will fluctuate. External seasonal weather must also be taken into account especially for warehouses. Temperature mapping is important for businesses and organisations dealing with temperature sensitive products, like biochemical products such as medications and vaccines. Verifying that the refrigeration systems maintain an acceptable temperature level for each specific product at all times is what temperature mapping is all about, and this is supported using ongoing monitoring systems. Once mapping has established where temperature variation points lie within the control system then monitoring can be installed. It is important to re check any back up systems to be sure that the chambers will work in other circumstances. Different mapping equipment gives different results. It is important to ensure that the equipment being used has sufficient accuracy ratings to give reliable data. For example, better equipment will provide readings that are accurate within plus or minus 0.3°C, whereas budget equipment may only have accuracy ratings of within 2.0°C. For products that must be stored within a limited temperature range, this budget equipment cannot provide sufficiently specific temperature data. Warehouses must have information regarding the building’s external conditions, as it is vital for effective mapping and monitoring. Warehouses are generally mapped for a full year to ensure all external conditions are accounted for in the data. This also helps to determine placement of monitoring systems due to influence of external conditions. Temperature-controlled rooms such as fridges or cold rooms can be mapped once as their external environment is controlled. However, it is advisable to make sure that other external forces that could change their temperatures significantly do not heavily influence the HVAC systems of these buildings or environments. The mapping in warehouses should take into account the fluctuation in the warehouse temperatures and conduct the tests during its most extreme levels. Load testing is important aspect of the temperature mapping process. It investigates how expected product levels interact with individual temperature controlled chambers. This testing takes into account whether the product will arrive in the required condition or if cooling is necessary. Testing should verify whether the chamber could cope with the maximum specified load arriving all at once to then be cooled. If it can operate properly in this situation, as well as operating effectively at full capacity, the chamber can be considered sufficiently load tested. It is also advisable to test the system’s performance by simulating failures, to ascertain whether the system could be used even while experiencing some equipment failures. Once the mapping process has been completed, sensors should be installed to allow for continued surveillance of the areas that have been identified as being most influenced by temperature change. The stable areas should be monitored to help with any troubleshooting. Sensor equipment can be split into zones according to the area affected by similar influences. For example, in a square or rectangular chamber, the zones in corners away from doors will behave much the same as each other, as will the zones adjacent to doors or fans. If the monitoring devices are zoned, data can be compared to provide overall information on how the system usually functions. To summarize, temperature mapping provides information on warmer and colder areas within temperature-controlled environments. They supply details on the overall operation of the systems. After temperature mapping a system, monitoring equipment can be installed to provide real-time feedback on system operations and its stability for product protection.